In this project we have used four push buttons for four different candidates. We can increase the number of candidate but for better understanding we have limited it to four. When any voter press any of four button then respecting voting value will increment by one each time. After whole voting we will press result button to see the results. 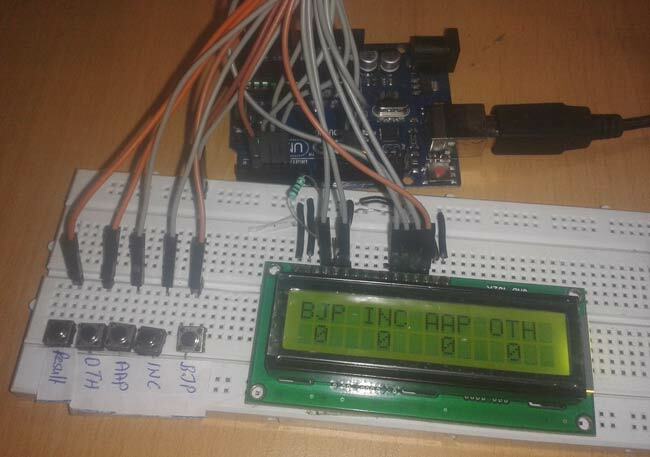 As the "result" button is pressed, arduino calculates the total votes of each candidate and show it on LCD display. The five push buttons are directly connected with pin 15-19(A1-A5) of Arduino with respect to ground. A 16x2 LCD is connected with arduino in 4-bit mode. Control pin RS, RW and En are directly connected to arduino pin 12, GND and 11. And data pin D4-D7 is connected to pins 5, 4, 3 and 2 of arduino. First of all we include header and define pins for LCD and than initialize some variables and pin for taking candidate's voting input means switch. After it, initialize the LCD and give direction to input-output pins. and then make pullup the input pin by software. In code we have used digital read function to read Button pressed. And then displaying voting on the LCD with the candidate party’s Name. Can you help me in addition with the recognition of finger print? If the same finger print is discovered and i will display error? Which software is being used to write program in arduino uno????? Arduino IDE software (Arduino Nightly : https://www.arduino.cc/en/Main/Software) is used to write, verify and upload/burn the code into Arduino. Where does pin 2 and 16 of LCD are connected. It is the symbol of Power supply positive terminal or Vcc. Either we can delay in between two continuous button pressing or for more accurate solution we can use finger print sensor. Hi !can u help me? When I am doing coding in ardino it showing code error .can u tell me why ? sir I am getting the error in the program as "stray '\302' in program" so what should I do and where are the 16 and 2 pin connected ? I tried this but nothing is getting displayed on the lcd . How much votes can it save? I mean how many votes can be saved on arduino's internal eeprom. I am using Arduino Uno which has 1024 bytes of eeprom. i am doing a project on fingure print voting can you please send me code for that! !